Thierry Binisti started out making short films for the Forum des Images, previously known as the Vidéothèque de la Ville de Paris. These shorts explored the themes of the city’s history, its inhabitants and its particular atmosphere. He then worked as an assistant director on INDOCHINE by Régis Wargnier, APRÈS L’AMOUR by Diane Kurys and TOUT LE MONDE N’A PAS EU LA CHANCE D’AVOIR DES PARENTS COMMUNISTES by Jean-Jacques Zilbermann. He directed the short film LE LIVRE DE MINUIT in 1996; starring Dominique Blanc and produced by TS Productions, it won many prizes in short-film festivals. After his first feature L’OUTREMANGEUR, he made many docudramas for French television. Jerusalem and Gaza - less than a hundred kilometers separate the two cities; home to Tal, a 17-year-old recent French immigrant to Jerusalem, and Naïm, a 20-year-old Palestinian confined to Gaza. After witnessing a bombing at her local café, Tal refuses to accept that only hatred can exist between these two peoples. 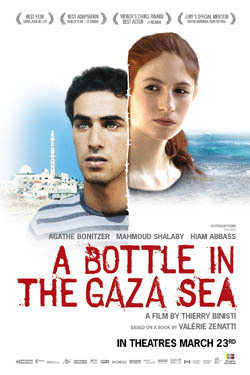 She slips a message into a bottle, thrown into the Gaza Sea, that will be discovered by Naïm. From there begins an email correspondence and the emergence of a slim hope that their burgeoning friendship may give them the strength to face the world and to change it in their own small way.